A quick and easy way to add a sleek look to your Corvette's license plate area. 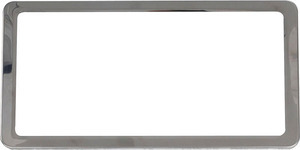 These frames are custom manufactured and use only the finest quality 304, mirror-polished stainless steel. Due to being made with the high-quality stainless steel, there will be no rusting or tarnishing of the frame for years to come. They fit all 50 U.S. state license plates.